Jacob was born with Chiari malformation, a condition that causes the cerebellum to push into the space normally occupied by the spinal cord. Having Chiari also led him to develop a syrinx, a fluid filled cavity in his spinal cord that required surgery. An MRI revealed further issues, and Jacob underwent an additional brain surgery. Jacob’s health challenges continue, being under observation for Ehlers-Danlos syndrome, a group of inherited disorders that affect connective tissues. Jacob suffers with multiple symptoms from his conditions including headaches, muscle weakness, numbness in his arms, hands and legs, as well as body temperature issues. He often wakes up in the middle of the night from debilitating pain. Jacob’s conditions have also caused delays in speech and motor skills. Jacob loves being outside, and hoped for a special play space. For Jacob’s wish, his backyard was transformed into his happy place with his own fun-filled playground. With the help of many caring people, Jacob’s wish turned into the play space of his dreams. In the fashion of a barn raising, the community came together for a very heartwarming playground raising. Sam’s Club #6528 in Cincinnati generously donated Jacob’s massive playground, a Backyard Discovery Timber Swing Set filled with all his favorite features. Marco’s Pizza and Papa John’s Pizza provided food for all the volunteers. 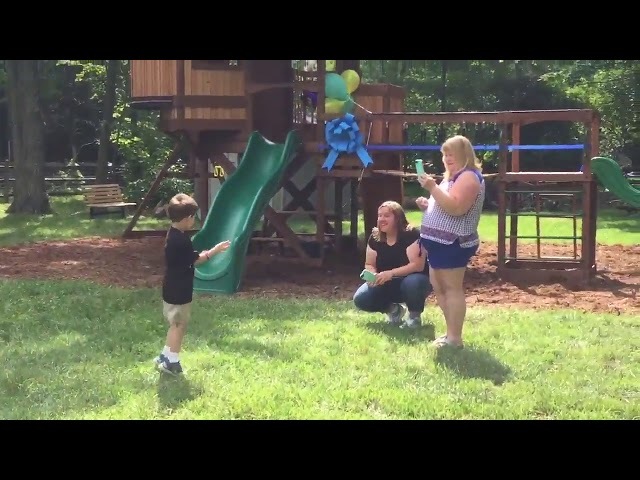 The Union Township Professional Firefighters Association Local 3412 made it their labor of love, coming to the rescue and making sure it was built in time for Jacob’s surprise reveal. Additional thanks to the Habitat Young Professionals for assisting with the big undertaking. Check out Jacob in the news! !